This is a reconstruction of a line following robot (built in 6th grade). 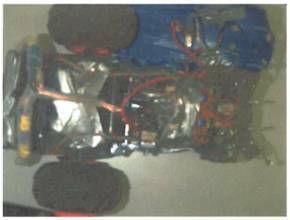 The IR sensors were replaced with photo resistors, allowing the car to follow light. It would automatically find the brightest part of the room. This robot won the Birmingham Technology Fair for the robotics category in the 10th grade.